When you first fire up Forza Motorsport 4, Jeremy Clarkson, whose infectious love for fast cars has made the show Top Gear into a worldwide phenomenon, waxes poetic about today’s public sentiment regarding car culture. “We are an endangered species, you and me,” says Clarkson, drawing you in with lamenting camaraderie. “… In an age of hybrid this and ‘lentil-matic’ that, we are the odd ones out. Yet there is hope. There is a haven — a place that celebrates speed, grip, gears, and fun — and it’s all here, for you to explore.” The playground Clarkson speaks about is, of course, Forza Motorsport 4, and what a pleasure garden it is. In the fourth edition of this driving game for the XBox 360, Turn 10 has created the best looking, best sounding and most enjoyable version of the game to date. The Forza series has always stood out, not only because of its great design and realistic physics, but also because it’s done a very admirable job of appealing to a double apex worth of gamers. Even if you’re a backmarker with no idea of what camber is or how to set brake bias, Forza can be set up so anyone – even young kids – can make their way around a track. However, if you’re an enthusiast who wants to tweak aero settings and fine-tune shift points, in search of that elusive extra tenth of a second, Forza is a great game for you too. It’s always been a popular game and one of the better racing selections on the XBox, but, to be honest, the third installment felt a little like a grind; race after race with only minor input from the player about what was going to happen next. 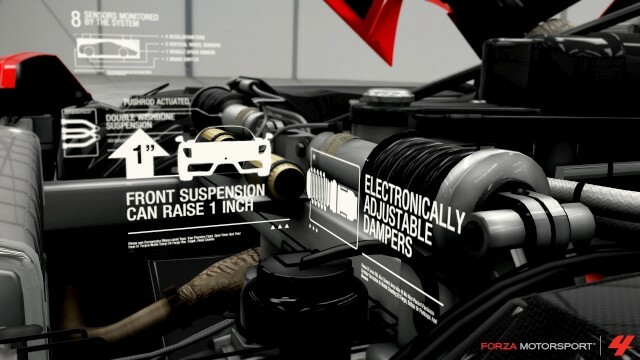 But where Forza 3 locked you into a series, Forza 4 offers lots of options. In career’s new interface, you move from track to track and, at every single stop, have a choice of three races you can participate in. At certain progression points, you’re rewarded a car. But, unlike in the past, you get to choose from a number of different cars, so you can build your garage to your liking. Forza 4 doesn’t just feel more open in career, either. In multiplayer, there are a number of new games, including tag, cat & mouse, and a version of Top Gear’s car soccer, which are all very fun. And the community actually feels like, well, a community. The game’s been made more social. Players have the opportunity to create car clubs and share their cars with other club members. What’s more, the new Rivals mode lets you challenge friends to a hot lap or Top Gear event, daring them to top your time or score, a competition that doesn’t demand you both be online at the same time. For those more artistically inclined, cars can be infinitely customized again, with a rich paint and decal set that was responsible for some breath-taking creations, attributable to Forza’s huge design community. The new game will feature more paint shapes, as well as the ability to import all of your painstaking designs from Forza 3. With a new graphics and lighting engine, Forza 4 looks absolutely stunning. As you blast down the back straight of the Nordschleife, you can see the trees of “The Green Hell” mirrored in your rear quarter panels. When you’re slingshotting through turn four of the Indianapolis Motor Speedway, the lazy summer clouds are reflected on your back window. 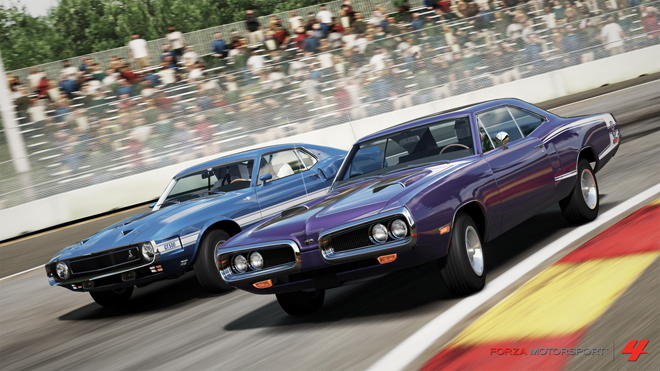 And it’s not just the track and the environments that look good; Forza 4 is also quite proud of its cars. There’s no better place to showcase some of the automotive masterpieces than in Autovista, a mode that lets you walk around some of the finer models and interact with the automobiles. Hot spots, when clicked, will trigger commentary about features, including some narrated by Clarkson. But it’s not all fantastic. Autovista is a neat feature once or twice, but it’s really just eye candy. What’s more, Forza 4 offers Kinect integration and it is – at best – a somewhat annoying novelty. You can use Kinect to maneuver through a neutered version of Autovista or to drive in some dumbed-down races (when the Kinect recognizes your input), but the whole thing feels like an unnecessary add-on. One of the things that’s missing from previous editions is the line of Porsches, which have usually been some of the better choices for racing in this game. There are plenty of other makes to choose from, but it’s unfortunate that a maker with Porsche’s racing heritage couldn’t make it into Forza this time around. Finally, it has always left me feeling a little flat to pull in for a pit stop and watch as an invisible pit crew refills my tank, changes my tires and fixes my automotive maladies. Pit crews are missing again in Forza 4 and, while it’s less of an issue this time around because endurance races seem to be off the race list, it still takes me out of the moment. At the same time, there are some really wonderful additions that make the game more fun than ever before. Multi-class racing puts faster and slower cars on track at the same time, making for some exciting races and hair-raising passing situations. The controls seem more sensitive than ever before. Panic-squeeze the left trigger and you may lock up the brakes and end up understeering through the corner and into the kitty litter; more finesse is in order this time around. While we see tracks like Sidewinder and New York failed to qualify for Forza 4, the game ships with a handful of new tracks including Infineon, IMS, and the Hockenheimring, not to mention the impressive new fantasy track, Bernese Alps. But, perhaps, the crown jewel is the inclusion of the Top Gear license. While this brings a smattering of Clarkson commentary, challenges, and a multiplayer mode, the highlight is the Top Gear test track. What petrolhead has watched an episode of the show and not wondered how he could do as the star in the reasonably priced car? Well, friends, now you have your chance. The Kia Cee’d, which is the current reasonably priced car, is in the game. Select it and do your level best to beat Mr. Bean’s time, or better still, take on the Stig’s times with some of the road’s finest supercars. This very inclusion is almost worth the price of the game alone. 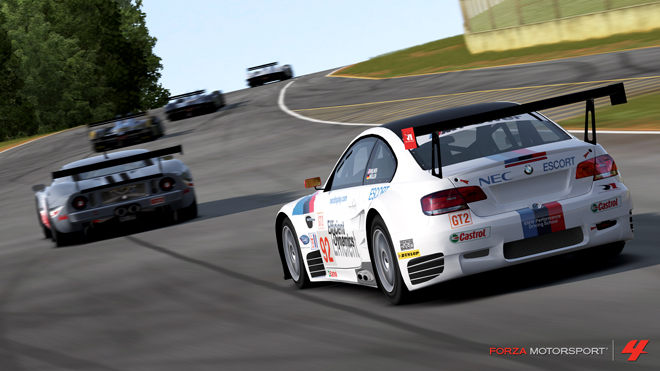 All in all, Forza Motorsport 4 is a lot like the previous version, only better. And with the deep customization, long career and improved social and multiplayer modes, it’s a game that can keep you occupied for months to come. Plus, as an “E” rated game, it’s one the whole family can enjoy. If you’re a “lover of performance and beauty and mechanical soul,” as Clarkson says, if you “love the roar of V8s and the smell of burned rubber,” pick up a copy of Forza Motorsport 4 today. You’ll be quite happy you did.